I love the varigated wool. 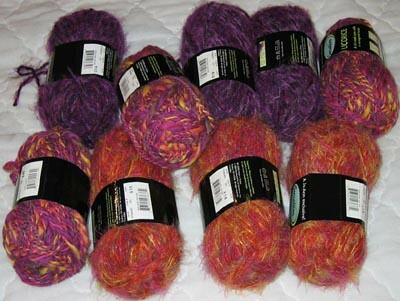 It’s the 3 skeins that are split up. They weren’t on sale, but the well coordinating purple and orange were, so I bought those, too. At first I was thinking of crocheting a bag with single crochet, or half-double crochet alternating with single crochet, or something like that. Maybe in stripes or something. 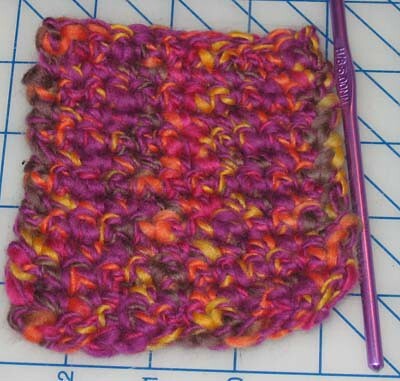 I started with 2 test squares, to see what size hook to use and how the yarn worked up. I’m really pleased that I guessed correctly on the right size hook for both. The varigated wool came out very nicely. I just love the colors. The purple acrylic is okay, and should look nice with the varigated wool. I will probably use these squares in the scrumble. The beginnings of the scrumble. 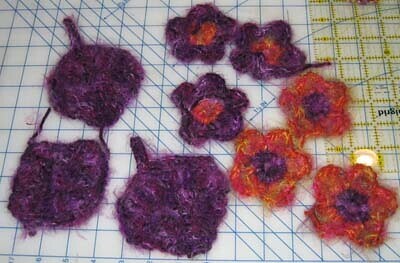 These flowers and leaves are from The Crochet Stitch Bible which I bought at Joanne’s with a coupon.